Miso is one of my favorite flavors. Sure, fermented soy beans don’t sound like they’d be good, but who can resist a steaming bowl of miso soup or salad dressed with bright, flavorful miso dressing? Typically I use miso when cooking fish – there isn’t a sea creature out there that doesn’t benefit from a nice coating of miso – but this time I used it in a vegetarian preparation. I simply mixed it with a little sesame oil and mirin to thin it ever so slightly and slathered it on slices of tofu and eggplant before broiling it (this would be just wonderful on the grill too). My husband reminded me that he’s not actually crazy about eggplant (how do I always forget that?) but then declared that he could eat this miso eggplant every day. And night. It was that good. The miso almost caramelizes under the heat, creating an umami-rich coating that is just packed with savory flavor. It is the embodiment of savory. Rice makes a nice accompaniment. Preheat the broiler. In a bowl stir together the miso paste, sesame oil, and Mirin. Pat the tofu dry between paper towels. 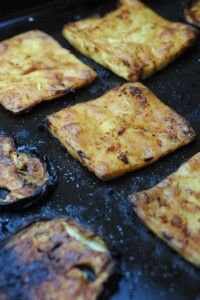 Brush the tofu and eggplant slices with the miso marinade on both sides until fully coated and transfer to a foil-lined baking sheet. 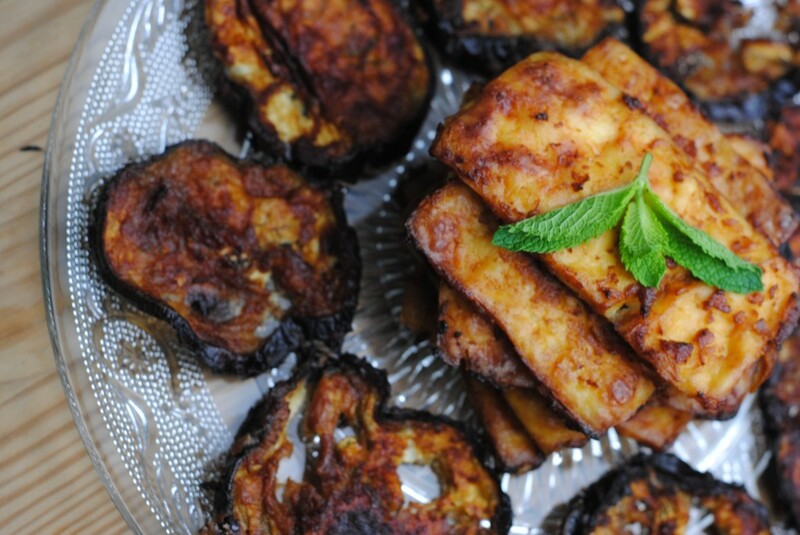 Put the tofu and eggplant in the broiler and cook until the miso has caramelized slightly, flipping once. Remove from the oven and allow to cool for a few minutes before serving. Wow, this looks incredible! Tofu and eggplant are two of my favorite foods. I’ll have to try this out soon! Thanks! They do make a great pair. I hope you enjoy! I also love miso and keep it on hand in the fridge all the time. It’s so versatile and just adds a complex savory quality to anything and everything. I completely agree! It’s one of my go to “pantry” (even though it has to be refrigerated) items. The eggplant sounds incredible. I like them grilled too. Thanks for sharing & hope you’re having a great week ahead. Miso + Mirin is the great combination – sweet and salty flavor. I usually add soy sauce to this, but I should try adding sesame oil, which gives nice additional layer umami. And Katherine, you are a great photographer. It’s so hard to take such a brown dish, and you did it so nicely! I already love this dish, even without trying it yet! Ooh soy sauce would be good too! I didn’t want to overpower the flavors too much and the sesame oil was flavorful but delicate. I love to play around with all of these flavors! And thank you so much for your kind words, Nami! You make me blush. I had something similar to this at an itzakaya restaurant a couple of weeks ago, it was incredible! Oooh I haven’t been, but I bet it was great! Thanks for stopping by! I hope you enjoy! It’s totally the only way my husband will eat eggplant any more. This sound delicious! I love miso and will definitely be giving this a try. Thanks!! I’m also a huge fan of miso – it gives such wonderful depth of flavor to anything you use it in! Do you have a sense of how long the dish is in the broiler before the miso “caramelizes slightly”? I am super new to cooking, are we talking like 5 minutes? more? less? Great question – it depends on the broiler, but it should only take a few minutes per side. Keep an eye on them.